We’re often asked for advice on changing eating habits, so we thought we’d pull all our top tips together into one place. Eating a healthy breakfast will set you up for the day. Research shows that regular breakfast eaters tend to be leaner and dieters are more successful at losing weight and keeping it off, so opt for whole grains and fruit and you’ll be much less likely to snack during the day, especially if you also eat a healthy lunch and dinner too! Try swapping your plate for a smaller one. It’s really simple but can be an effective weight loss tool, as it helps with portion control. Serving your dinner on a smaller plate means it will look as if you’ve got more to eat and can “trick” your mind into being satisfied. If you have time, try and keep a food diary. nes! At the very least, it will remind you about those couple of biscuits you had for elevenses when you’re deciding whether to have a dessert after dinner. This is so true when you are trying to stay on the healthy route to weight loss. By planning and preparing your meals in advance, you’ll be able to stay on track and you’ll stop being so tempted to reach for the sugary snacks. Getting your “5 a day” can really help! By eating plenty of fresh vegetables and fruit, which are full of fibre, you’ll feel fuller for longer. 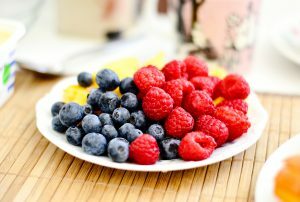 Try adding a handful of berries and slices of banana to your breakfast: adding onions and mushrooms to bolognaise sauce or lasagne or adding and handful of frozen peas and sweetcorn to a shepherds pie can easily increase your vegetable intake with little or no effort. Look out for the traffic light system on food packaging. Nutrition labels can help you choose the right products and keep a check on the amount of foods you’re eating that are high in fat, salt and added sugars. By comparing these labels when out shopping, you can easily make better choices and still enjoy your favourite foods. Did you know that we often confuse feeling hungry with actually being thirsty! 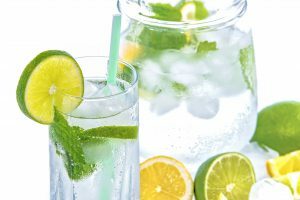 Keeping hydrated throughout the day can stop you from over eating, it’s also great for your complexion and increases energy & relieves fatigue, which is perfect if you’re planning a trip to the gym after work! Finally, don’t completely ban your favourite foods. Plan to treat yourself once a week will help stop the cravings. Enjoying a bacon butty OR small bar of chocolate at the weekends will mean you’re more likely to stick to your healthy eating routine till it becomes a normal way of life.